Does California Need More Power Plants? LOS ANGELES - California energy officials are, for the first time, rethinking plans to build expensive natural gas power plants in the face of an electricity glut and growing use of cleaner and cheaper energy alternatives. The Los Angeles Department of Water and Power announced Tuesday that it has put a hold on a $2.2-billion plan to rebuild several old natural gas power plants while it studies clean energy alternatives to meet electricity demands. And the California Energy Commission may decide as early as Thursday to halt a natural gas project in Ventura County. The scrutiny comes after an investigation found that the state is operating with an oversupply of electricity, driven largely by the construction of gas-fueled generating plants, leading to higher rates. The state’s power plants are on track to be able to produce at least 21% more electricity than needed by 2020, according to the Times report. Californians are footing a $40-billion annual bill while using less electricity, paying $6. 8 billion more than they did in 2008 when power use in the state was at its all-time high. Electricity consumption has since fallen and remained largely flat. Utilities in California have been on a years-long building binge, adding new natural gas plants even as the nation’s electricity system has undergone significant change. Where utilities once delivered all electrical services from huge power plants along miles of transmission lines, the industry now must consider power delivered to the electric grid not only from its own sources, but also from solar systems and batteries at homes and businesses. At the same time, utilities have been aggressively upgrading or rebuilding their aging natural gas plants — a move critics have said is unnecessary because consumers are using less power and clean energy technology is making those plants obsolete. 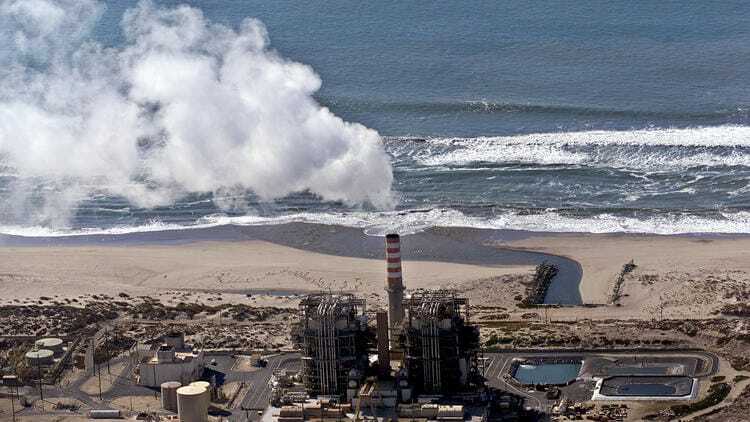 The DWP and energy commission moves involve as many as seven natural gas plant projects proposed for Southern California, from Oxnard to Carlsbad, at a cost of more than $6 billion. Reiko Kerr, the DWP’s senior assistant general manager of power systems, said given the changes in the energy world, the assessment is necessary to protect ratepayer dollars and the environment. “The whole utility paradigm has shifted,” Kerr said in an interview. “We really are doing our ratepayers a disservice by not considering all viable options. State and local governments have felt a heightened sense of urgency to deal with climate change after President Trump decided last week to withdraw the United States from the Paris climate accord. California already has mandated that at least 50% of the state’s electricity come from clean energy sources by 2030. Senate leader Kevin de León (D-Los Angeles) wants to increase that to 100% by 2045. Building or overhauling natural gas plants throughout Southern California, environmentalists argue, isn’t helping achieve those goals. The DWP’s move to delay plans for the fossil fuel plants, which seemed all but set to be built, came as a surprise to clean-energy advocates, who hailed the decision. “This is a great first step toward smart energy investments that save customers money, ensure the lights stay on and protect our health and environment,” Graciela Geyer of the Sierra Club said. The environmental group said that if the utility had moved ahead with the $2.2-billion investment in repowering natural gas plants, it “would have blown an irreparable hole in the city and the state’s hopes to achieve 100% generation” from clean energy sources. The gas-fired generating units slated for demolition and rebuilding are at the Scattergood, Haynes and Harbor electricity plants, which range from 34 to 67 years old. As a group, the three plants have generated less than 20% of their combined capacity since 2001. The Harbor facility has operated on the low end at just 7%, while Haynes ran on the high end at 22%. “The old model, the old legacy clunkers, won’t get us into the future we want,” DWP’s Kerr said. DWP staff members told the utility’s’ commissioners Tuesday that their analysis of possible alternatives would be completed no later than early 2018. Separately, the California Energy Commission this week is evaluating whether to halt a natural gas project in Ventura County after the state’s electric grid operator offered to conduct a study of clean energy alternatives to the roughly $250-million project on Mandalay Bay in Oxnard. An energy commission committee has been deliberating since a hearing Monday during which Southern California Edison and the project’s developer, NRG Energy, argued that a study is simply a delay tactic that probably would kill a project needed to ensure reliable electric service. The California Independent System Operator, which runs the state’s electric grid, told the energy commission that it would take three to four weeks to conduct its study on alternatives to the Oxnard natural gas project. Energy commission members reviewing the study proposal are scheduled to meet again Thursday to consider the offer. The board of governors for the California Independent System Operator made the unusual offer at its May 1 meeting to conduct a eleventh-hour study of clean-energy alternatives to building a new natural gas plant. “If we’re going to be moving forward with a gas plant at this time, in this juncture, in the context of everything that’s going on, not evaluating other alternatives that are viable, noncombustion alternatives, is a missed opportunity,” Angelina Galetiva. a commission board member, said during the May 1 meeting.